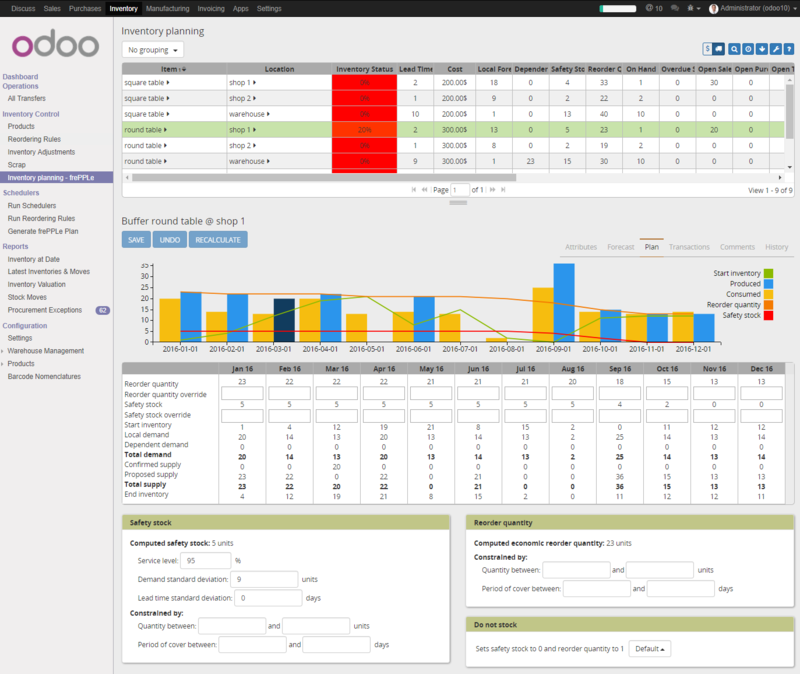 FrePPLe provides an integration with the Odoo, a leading open source business management suite. The connector retrieves all master data required for planning from Odoo. The connector publishes the resulting plan back to Odoo, either a) automatically at the end of the planning run or b) after manual review and approval by the planner. The connector reads the data directly from Odoo and writes the results back. Compared to replicating data to its own database, this provides a more native and tighter integration. 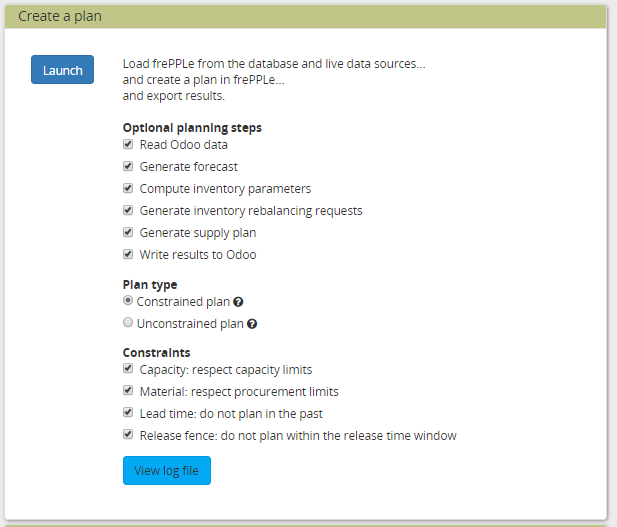 It is still possible to save a copy of the odoo in the frePPLe database to use the frePPLe user interface. Users can access frePPLe screens from the Odoo interface, without logging in a second application. Implemented as an odoo addon module, it is easy to customize the connector to your needs. The integration has been developed and tested with v10 (main development focus), v9 (support-only) and Odoo v8 (outdated). Here are the slides presented during the Odoo user conference in October 2016. The sales menu has a link to the frePPLe forecast editor screen. In this screen users can review and edit the sales forecast at different levels in the product, location, customer and time dimensions. Note that this screen is only available in the Enterprise Edition of frePPLe. When using the frePPLe Community Edition these links will result in a page-not-found error message. The inventory menu has a link to the frePPLe inventory planning screen. In this screen users can review and edit the stocking policies for each item location. The manufacturing menu has a link to the frePPLe plan editor screen. 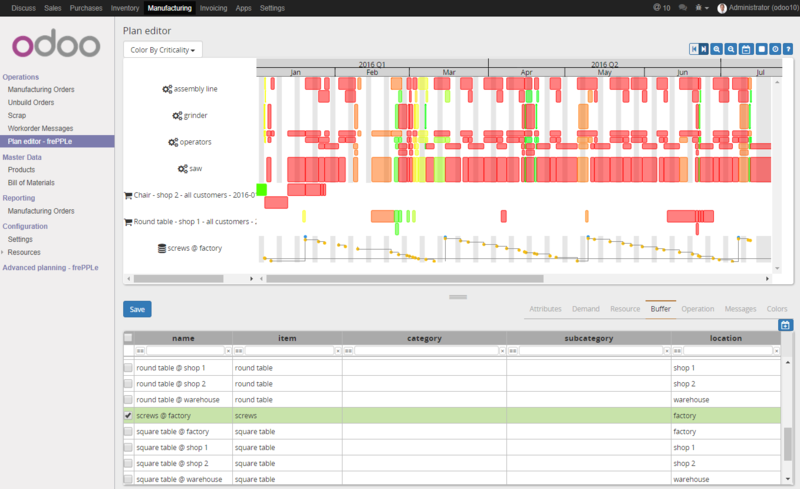 In this screen an interactive Gantt chart is shown where users can review the plan and adjust where appropriate. Changes to the plan are automatically propagated to predecessor and successor production steps. The manufacturing menu also contains a link to the complete frePPLe user interface. The manufacturing menu has an extra task to recreate the plan using frePPLe. A scheduler task to recreate the plan as a cron job. The odoo integration brings new functionality to the user interface. The execute screen has checkboxes that allow enabling reading from and writing to Odoo. The plan exported to odoo is a subset of the plan which passes certain filter conditions. The remaining part of the plan can only be exported manually from frePPLe to Odoo: see below. The connector distinguishes different modes to retrieve data from Odoo. 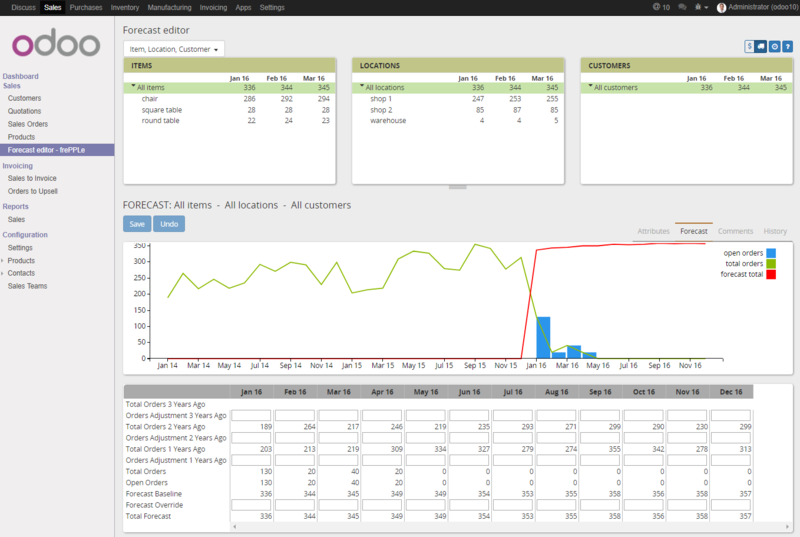 This allows us to schedule the interfacing of larger and/or slowly changing data volumes (eg sales order history over the last few years as required for the forecast calculation) from the extraction of data elements that need to be retrieved whenever the plan is generated (eg open sales orders, current inventory). Using the argument odoo_read_1 or odoo_read_2 specific the requested data extraction mode. By default all data elements are extracted in mode 1. It requires customization of the Odoo addon to define for which data elements you want to use mode 2. An incremental export from the frePPLe user interface for individual purchase, manufacturing and distribution orders. When selecting a sales order for incremental export a popup window is displayed with a list of linked purchase, manufacturing and distribution orders. A typical usage is to automatically export the proposed purchase for cheap or fast moving items, and let the planner review and approve the proposed plan in frePPLe for expensive or slow moving items. All mapping logic between the Odoo and frePPLe data models is in this module. The results are accessible on the URL http://odoo_host/frepple/xml from which the planning engine will read data in its native XML data format and to which it will post the results. This module gives frePPLe the capability to connect to Odoo, read the data from it, and publish back the results. It also activates additional menus in the frePPLe user interface. The section below describes the installation and configuration of these. The addon code is found in the folder contrib/odoo, or you can pick up the latest version from github https://github.com/frePPLe/frePPLe/tree/<version>/contrib/odoo (replace <version> with the frePPLe version you are using). Use the addon from the subfolder matching your Odoo version. The module adds some configuration fields on the company model. A secret random string used to sign web tokens for a single signon between the Odoo and frePPLe web applications. Choose a string that is long enough, random and contains a mix of lower case characters, upper case characters and numbers. References a resource.calendar model that is used to define the working hours. If left unspecified, we assume 24*7 availability. The connector assumes each company has only a single manufacturing location. All bills of materials are modeled there. Command line launched when the plan generation for a company is launched interactively from the user interface. Note that when launched from a scheduler cron job, the command line is configured on the job directly. You can run a quick test of the above by opening a web browser to the URL http://<host>:<port>/frepple/xml?database=<db>&language=<language>&company=<company>. The parameters db and company determine which odoo database to connect to. After providing the login details, an XML document will be displayed with the data that frePPLe will read from Odoo. Assure that the “freppledb.odoo” is included in the setting INSTALLED_APPS which defines the enabled extensions. By default it is disabled. Update the DATABASE section such that the SECRET_WEBTOKEN_KEY setting of each scenario is equal to the web token key configured in Odoo. For improved security it is recommended to specify this password in the setting ODOO_PASSWORDS in the djangosettings.py file rather then this parameter. odoo.language: Language for the connection. If translated names of products, items, locations, etc they will be used. The default value is en_US. odoo.filter_export_purchase_order: Python filter expression for the automatic export of purchase orders. This parameter currently not used. The expression gets as arguments ‘operationplan’ and ‘buffer’, and it should return True if the transaction is to be included in the automated bulk export. odoo.filter_export_manufacturing_order: Python filter expression for the automatic export of manufacturing orders. odoo.filter_export_distribution_order: Python filter expression for the automatic export of distribution orders. The connector doesn’t cover all possible configurations of Odoo and frePPLe. The connector will very likely require some customization to fit the particular setup of the ERP and the planning requirements in frePPLe.